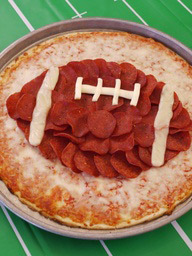 Pizza with a football formed from pepperoni and cheese. 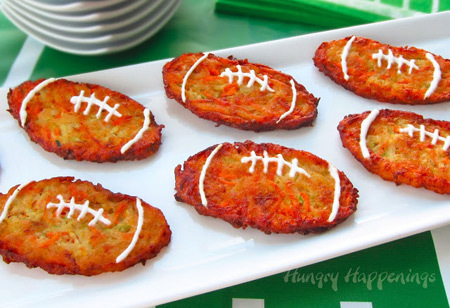 Looking for some ideas for Superbowl food? 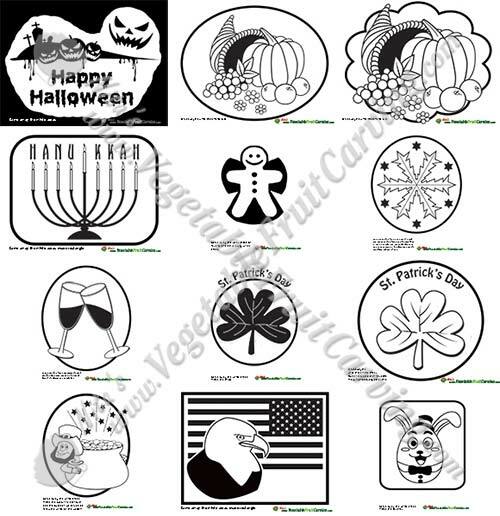 Whether you are hosting a small get together or a large party, here are a bunch of fun and creative ideas that you can put to use for your party. 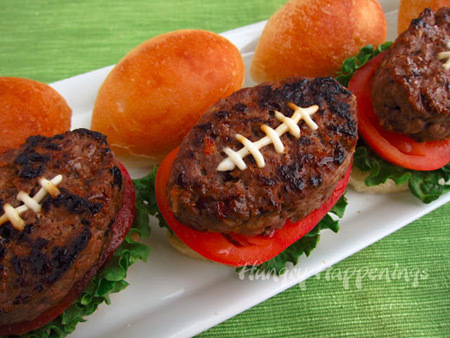 These Superbowl food ideas don’t have a piece of fruit anywhere in sight. 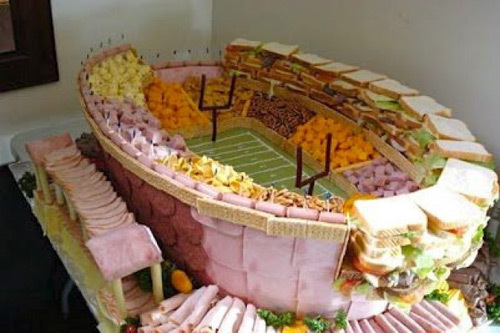 But this is the Superbowl – the king of junk good events. 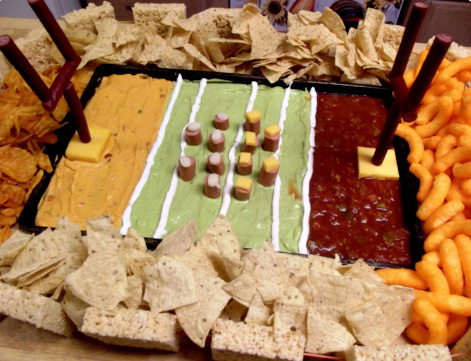 The following photos feature pizza, burgers, chips, dips, sandwiches, fried food and desserts all in the football theme for Superbowl Sunday. Recently I showed you some watermelon football helmets. 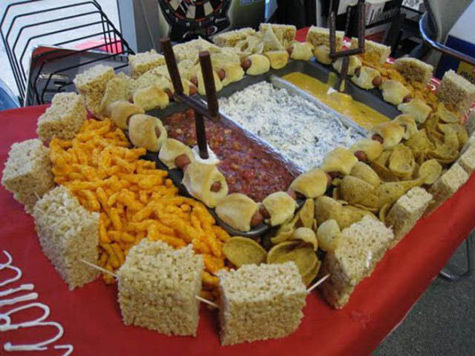 Now, take a look at these amazing superbowl food stadiums. 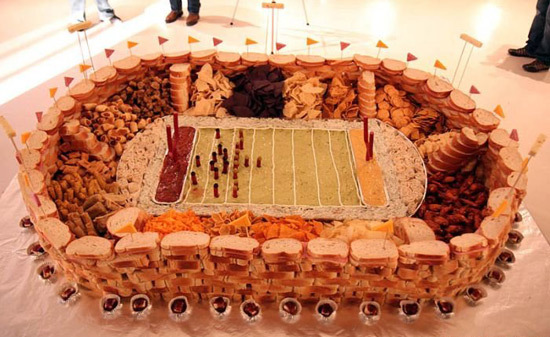 This huge food stadium made of hoagies, pigs in a blanket, chips, dips and crackers is a Superbowl feast. 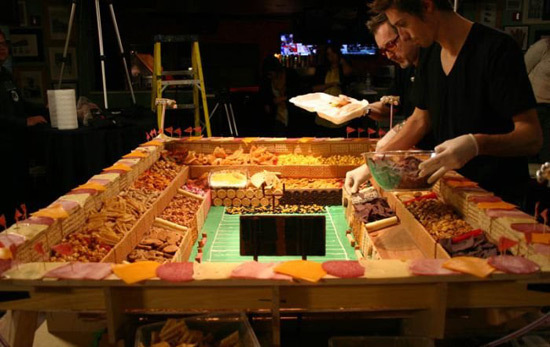 These next few football stadiums made of meats, cheeses and sandwiches are big enough to feed a crowd. 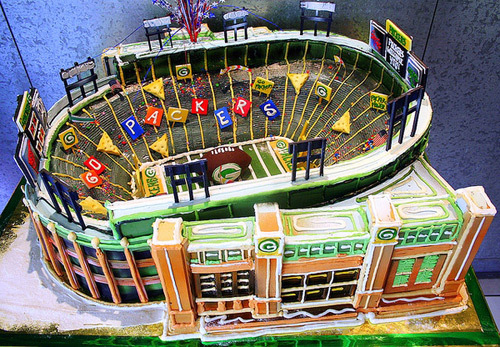 This Party sized food stadium is quite a production with details right down to the Ding Dongs and Twinkies to form the cars in the parking lot. 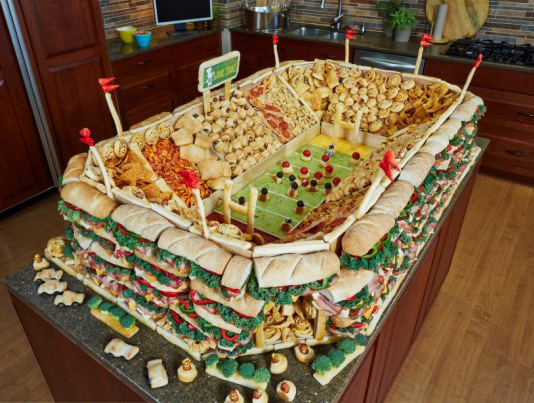 The men setting up this Superbowl food display gives you a sense of the large size of this Superbowl food display. Why not add a little dessert by putting chocolate candy around the edges? 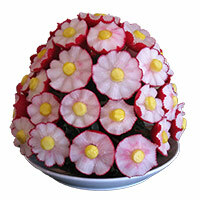 Is you have a sweet tooth, look further down this page to see a couple of Superbowl food dessert ideas. What is you are having a smaller party. 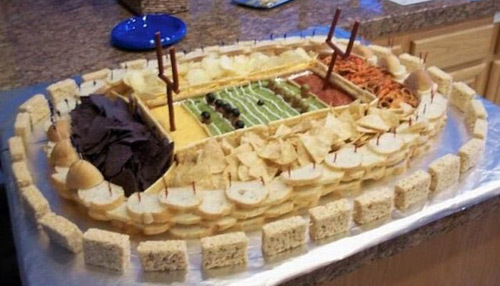 This next football stadium is made of chips and dips surrounded by krispy treats would be a bit easier to make. 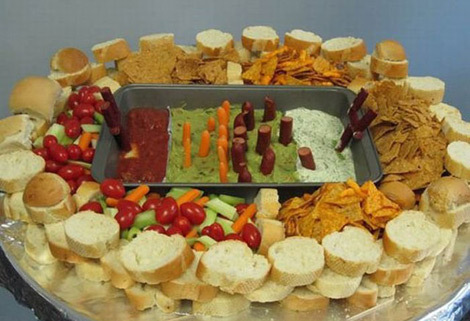 The next two chip and dip Superbowl food ideas would be perfect for a smaller home party. 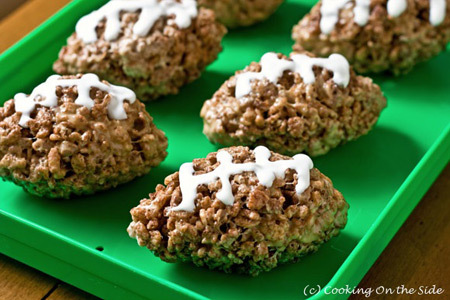 For dessert lovers, here are a couple of Superbowl food ideas. How about cocoa krispy treats? 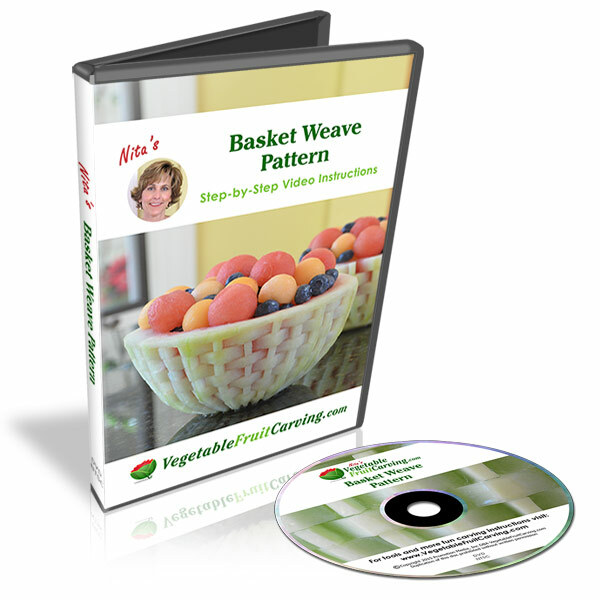 Thanks to Kathy Strah, you can get the recipe here. 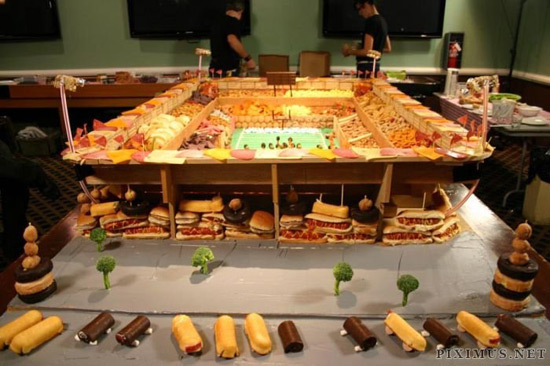 Last but not least is this fantastic football stadium cake. A lot of care and work went into this. I hope these photos have given you some ideas and inspiration for making Superbowl food for your party.